It looks so simple doesn’t it? Just blow big chunks of crystal off it till it dies, well if thats the case you have never tried it. Unlike the one in star trek the next generation this one isn’t going to die if you give it a little harmonic tremor. This thing is a beast and I must say that I have changed my mind on end game content. This entity definately qualifies for end game content. Just to give you an idea I personally spent about 2 hours trying to kill it with tons of other people and we never got it below 34 percent health. There are quite a few reason as to why, so I thought a post would be in order here. There are two ways that I have found so far to join the battle. Fly to the entity and talk to it. This will allow you to join the queue. Open your player versus environment (PVE) queue from the little down arrow on your minimap this will also allow you to join the queue. This is a mission that seems pretty simple, kill the crystalline entity. This is actually how I found the entity in the first place. There is a problem with this though as there is going to be between 10-19 other people in there with you and you unfortunately have no control over how it goes other than trying to do your part. 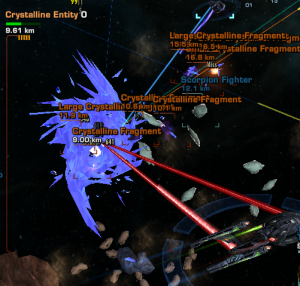 A raid in Star Trek Online? Yes, if any of the content can be compared to a raid the crystalline entity is it. If you were or have been a World of Warcraft player in the past you will understand the difficulty of getting 20 people to do the right thing at the right time. There are a few things about STO in particular that make this even more difficult. The in game voice chat is almost never used, so coordinating a large group of people becomes very difficult because it must be done in the chat window. Secondly, even getting people to read the mission in STO is difficult because in a lot of the missions it is simply run to the next circle on the minimap and shoot stuff. And probably the most difficult part is the lone wolf aspect. Fleet? We don’t need no stinking fleet. In theory it’s really simple to kill the Crystalline Entity. You orbit it about 8km out, drag the large crystals away from it. Blow up the crystals, and destroy the small crystals before they fall back to it. The reason you don’t want them to fall back to it? The heal the thing for more damage than three starships do in a full minute. Wait, what did he say? Yeah thats right, you let those shards fall back to it and it will heal itself quicker than you can damage it. We literally had everyone ignore everything else and just shoot the entity and it laughed at us. Can you see how this is going to make you want to pull your hair out yet? The first thing that normally goes wrong is someone who just start using torpedo launchers, mines, or other area of effect (AOE) weapons on the entity or it’s shards. Why is this a problem? Well if you are not extremely careful you blow up the large fragments while they are really close to the entity. Those fragments turn into small ones and heal the entity before you can blow them up. So area of effect weapons are bad mkay? The problem with that is when someone brings a torpedo setup, and as rare as the things are they seem to cluster in the entity queues. Secondly, people forget to shoot the fragments. It never fails that you will see half the group ignoring the fragments and just shooting the entity itself. Why is this a bad thing? Because of the healing of course. If you ignore the fragments you can rest assured that you are wasting your time. It heals so much from even one of those fragments that it will laugh at your puny damage. There is also the problem with repulsion beams. There are quite a few people who have bridge officers with the repulsion ability. On the surface it looks like a wonderful solution to some of the problems. You can just push them away and it will be wonderful right? Well, I guess if you are really skilled you probably could make it work. However, most people aren’t and they literally push the crystals to the entity thereby healing it faster. Okay, so doing this with a pick up group (PUG) is probably not going to happen. It is too complicated for random people to do random things and luck up and kill it somehow. So what do I suggest? A fleet, one with enough people that you can actually get 12-15 players on comms at the same time to listen to instructions from a fleet commander. While this is a bit off the subject of the crystalline entity, I think a word or two needs to be said here. I will eventually do a good writeup on the various types of fleet comms but for now, a basic description will have to do. Communications in raids is crucial most of the time. The ability to say things like “I need heals”, “everyone shoot at this target”, “Leroy don’t run in there alone” are very crucial. The problem is typing something like that takes time and sometimes you need really quick action. It is very easily solved by using a voice communcations program. Most MMO’s have simple voice communications built into them and Star Trek Online is no exception. But alot of groups don’t like it because there is no form of security. This leads to third party programs like Ventrillo and Teamspeak 3. As I said we tried for 2 hours and did not kill it, during this time we cycled through probably 60 or so players joining, getting frustrated, and leaving. Now, I am not saying to not try it. I believe that everyone should try everything at least once but in my experience this particular mission is not worth doing without a good fleet. 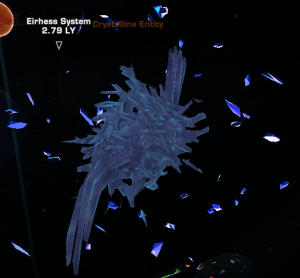 To put it in perspective yesterday a fleet of Klingons took the entity down in a little over 7 minutes and I have heard stories of groups that can do it in 3 minutes. So, when I find a fleet that I like and that is interested in trying the entity I will write up how we kill it. For now, I will just have to leave you with the experience we earned the hard way.